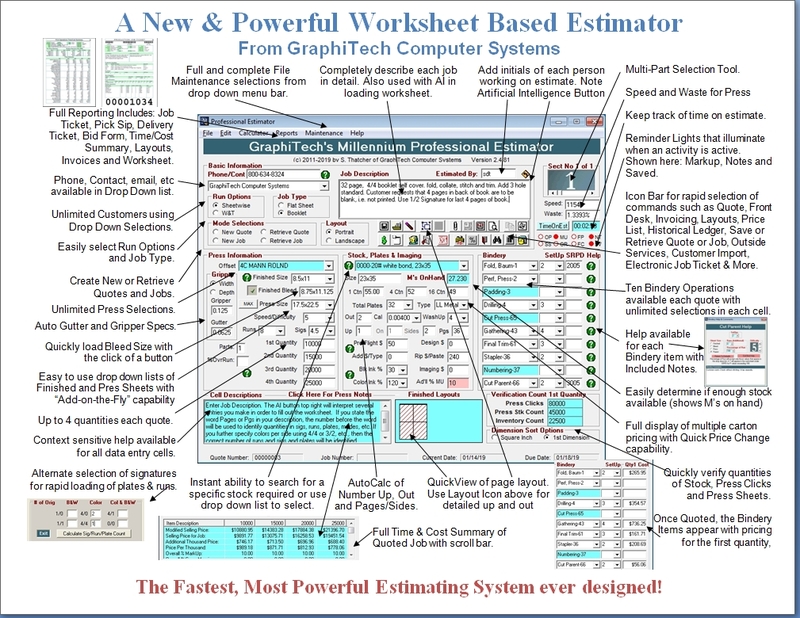 Modular Software: Each software package from GraphiTech is modular and is completely self-contained. There is no need to purchase additional modules if your situation doesn't warrant that type of system. For more detailed descriptions, spec sheets and pricing, go to our Product Catalog. 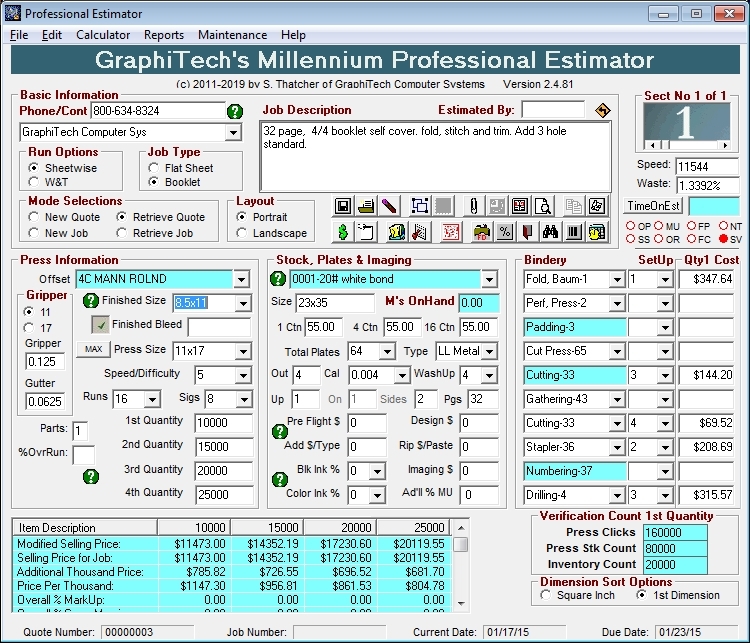 Estimating/Order Entry: The hub of GraphiTech's Global Management System is our Millennium Professional Estimator or our Estimating/Order Entry program. An estimate can be specified in under a minute and when the estimate is completed, a quotation is either mailed or emailed to the client using our internal PDF generator. Once it is approved, the quotation is retrieved, job specific information is added to the quote and a job number assigned to complete the Order Entry process. 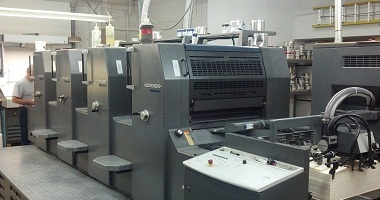 Using our Artificial Intelligence button, a complex 48 page booklet with separate cover on different presses using different stock can be completed in less than 3 minutes and that includes pre-press, bindery and outside services. 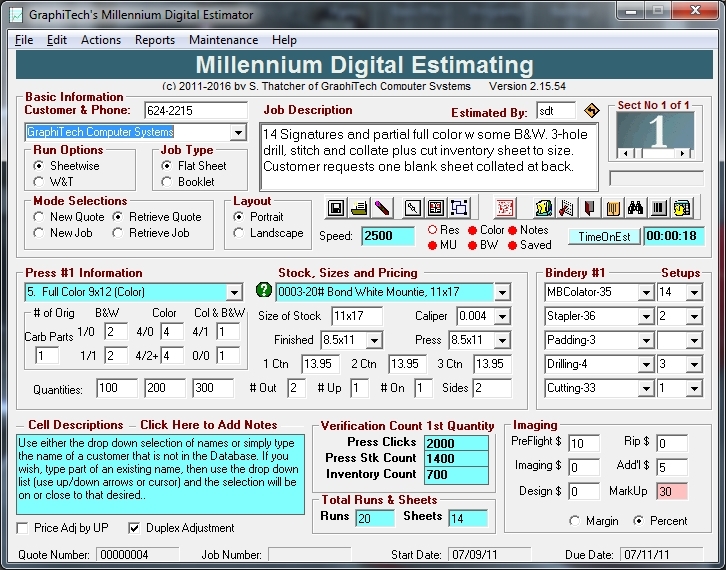 Digital Estimating: For those quotes and jobs that require an estimate of the work done created by Digital Presses, the Millennium Digital Estimator allows the estimator so much capability it's hard to imagine ever performing an estimate by hand ever again. For example, try estimating 4 different 4/4 brochures, a small 8 page catalog 2/2 with a blank sheet in back for notes and a single 1/0 flyer, all using different stock and full bindery. 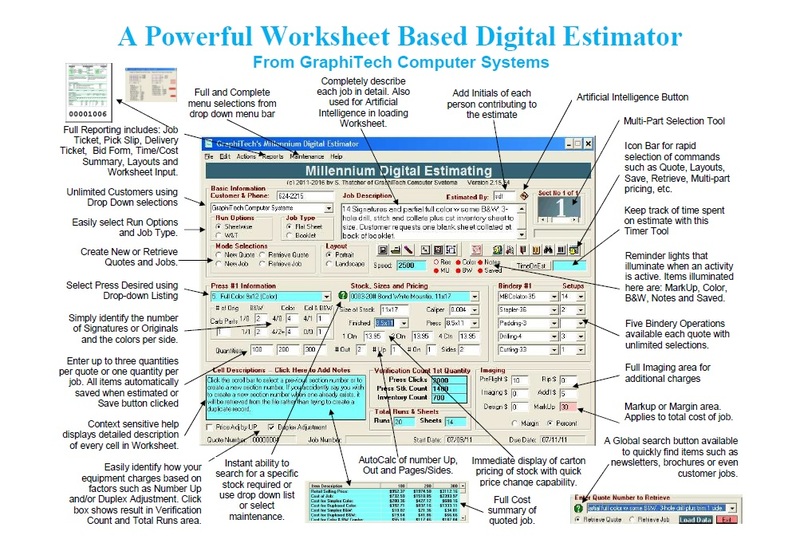 With the Digital Estimator it only takes 4 minutes. Job Tracking: Now you can enjoy the benefits of Real-Time Job Tracking. Instantly identify not only the current location, but also all previous activity for any job in the plant. 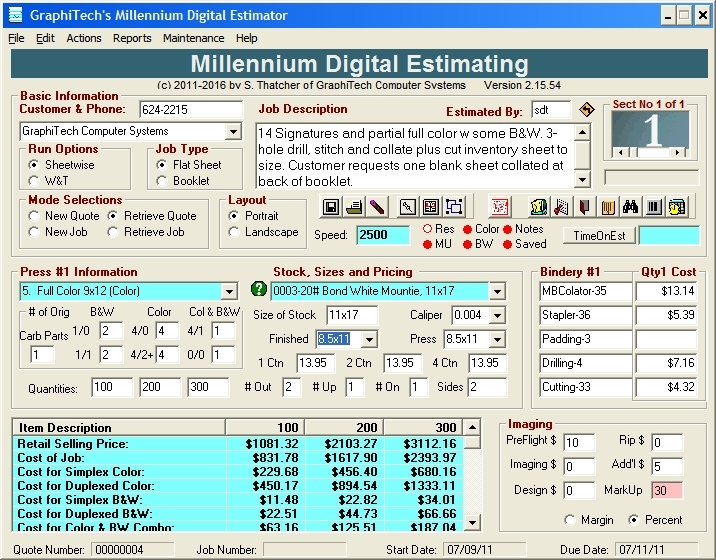 Easily save hundreds of hours annually in locating jobs, both in the plant as well as those “on hold”, “at your Vendors”, or even in remote plants. Job Costing: The Shift Report shown identifies the type of work that was performed the previous day. 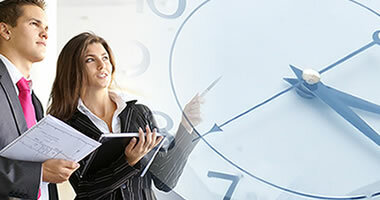 By having the employees read their shift report for accuracy, both management and the employees become more aware of the volume of work performed each day. In addition, various efficiencies are displayed such as Total, Productive, Non-Productive and Non-Chargeable. In this shift report, the employee was not logged in for a period of 1:40 hours. This resulted in a Non-Productive efficiency of 21%. The employees need to know that their Non-Productive Efficiency needs to be as low as possible. Ideally, they should aim for 100% Productivity. The NC stands for Non-Chargeable and is a reflection of the amount of work being done by the employee in which the company receives no revenue. In a typical Job Cost report, every aspect of cost is reported. Materials, labor, customer corrections and more. With this report, you will never lose track of what went into the job prior to billing! By combining pie and bar charts with the Job Cost report, management can quickly determine the extent of chargeable Vs. non-chargeable activities as well as the ratio of contribution by various departments. 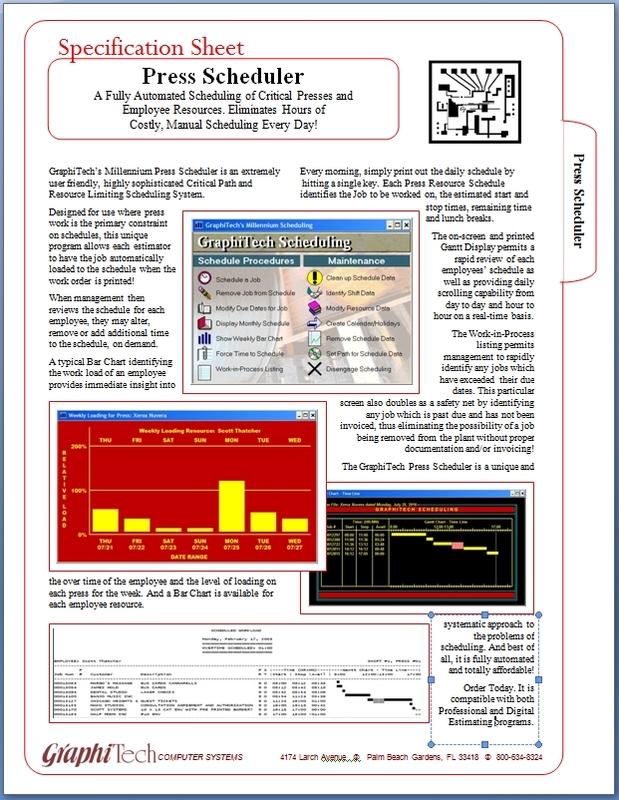 Other reports Include: Employee and Equipment Productivity; Payroll Report that identifies breaks, lunch, overtime and other details; Job Status/Location Report; Work-in-Progress Overdue; Departmental Production; Time Clock Report; Activity; Job Listings and our unique Pivot Report that has multiple drill-down capability. KeySys Shop Floor Data Collection: KeySys represents GraphiTech’s most powerful and accurate real-time data collection system. By utilizing Bar Code Scanners in a multi-drop network, we minimize the use of an overly large network as well as providing for fewer errors in input. Only one terminal is used to drive up to 50 KeySys keypads. And the system continues to run (and sound a tone) even when the Viewport has been minimized. 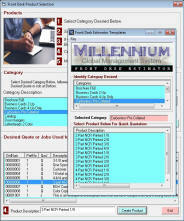 TermSys Shop Floor Data Collection: TermSys captures similar data to that of KeySys except this system uses computer monitors for purposes of collecting data. Items such as shift start and end, materials usage and job cost labor activity. This information is sent to the server for use by other networked terminals on the system. If using the programs in a stand-alone environment, then all data will be placed on the single computer for use by any of our other programs. TermSys and KeySys both use Bar Code Scanners although either one will operate very effectively without them, relying on verification algorithms instead of bar code accuracy. Invoice Interface: The GraphiTech Invoicing Interface is capable of posting transaction data directly to QuickBooks and Infinity accounting. 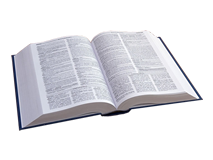 This includes items such as Accounts Receivable, Sales Tax Payable, Freight, Revenue (Sales), plus other items such as Terms, Messages, etc. In QuickBooks, the invoice may be retrieved and reprinted, as desired. 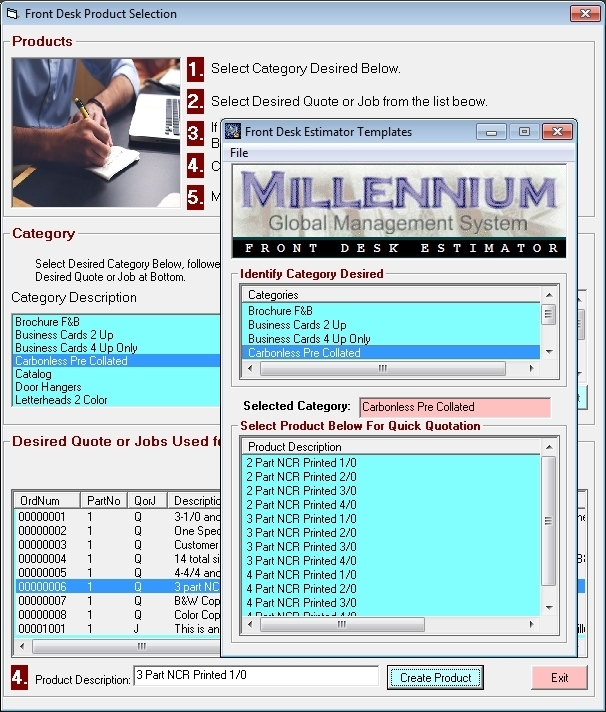 All information fed to the invoice is derived from either estimated or job cost data. TeamViewer Remote Access: GraphiTech now provides a link that you can download from our Support page. Just click on the Remote Teamviewer Support link and you will be provided a UserID and Password for our team to access your computer (you can view all activity and stop any actions you deem to be a problem) where we can provide both Training and Support for any problems you may have. This service is FREE for all customers on a Maintenance Contract.